As the winter in Delhi progresses, moongphali wala's (peanut vendor) ubiquitous presence is welcomed across the nooks and crannies of the city. It is virtually impossible not to find it at a stone's throw distance from where people congregate in public. 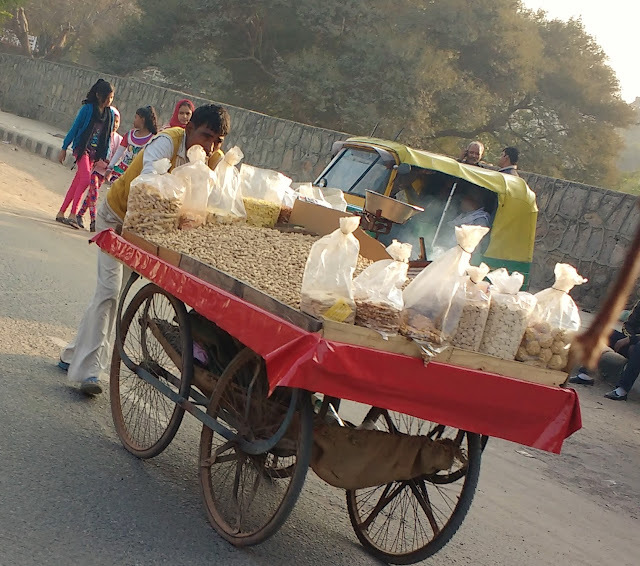 It is a common sight to see a peanut vendor with his various offerings in a cart standing near the bus stops, railway stations and almost all the crowded joints selling his provisions. It is a favourite pastime of Delhi wala's too to munch on their favourite snack in the form of roasted peanuts that is available in different forms and sizes with these vendors. The vendors put an earthen pot with hot coals in the middle of the groundnut heap to keep them warm and hot. Sometimes I have a feeling that it is the warmth that people appreciate more than the peanuts itself.